Chemical changes occur when substances undergo changes in their composition. When a substances undergoes a chemical change , we say "a chemical reaction has taken place". It is inconvenient and time-consuming to express what happens during chemical reactions by writing the complete names of all substances involved ( word equation ) ; instead, chemists write a concise statement, called a chemical equation, using the symbol of the elements and the formulas of compounds. 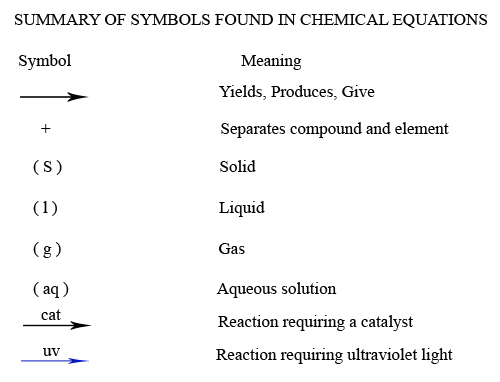 Other special symbols are added to the equation to express exactly what is happening during chemical changes. A Chemical equation has two parts : (1) Reactants and (2) Products. Reactants, sometimes called starting materials, are all substances present prior to the chemical change. Each reactant is listed by writing its symbol or formula separated by a plus (+) sign. All reactants are written to the left of an arrow (→) that separates the reactants from the products. In our example, hypothetical substances A and B are the reactants, and C and D are the products of the reaction. The above equation is translated as reactant A combines with reactant B to yield product C and Product D"Note that the arrow is read as to yield or yield or gives. 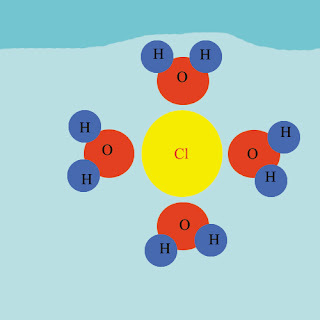 Translated to a word equation, this state "reactant A , in the gas phase, combines with reactant B, In the liquid phase, yielding product C, which is dissolved in water, and product D, in the solid phase". Conditions required for the reaction to take place are also written into the equation. They are placed either above or below the arrow. If heat is needed for the chemical change, the word "heat" or more commonly the greek letter delta, is written above or below the arrow. Sometimes the actual temperature is expressed. This is symbol in chemical reactions and the meaning ! Various reactions require catalysts, which are substances that increase the rates of reactions and are recovered basically unchanged after the reaction. The word catalyst the abbreviation "cat" or the actual name of the catalyst is written above or bellow the arrow. Any special conditions ( high or low pressure , presence or absence of light , etc ) are also written near the arrow. 0 Response to "Components Of A Chemical Equation"